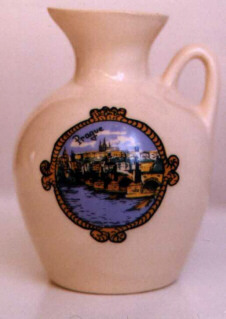 This third 1999 series consists of 3 ceramic jugs that depict famous Czech historical cities and contain King Barley Malt Whisky over 6 years. Newly in 2000, the series is available in a decorative cassette (see below). 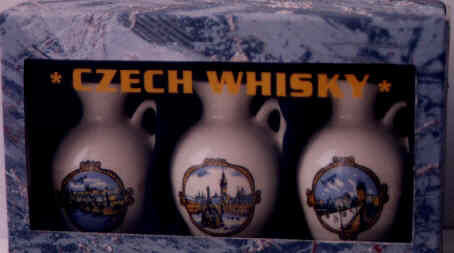 Jim Murray's Complete Book of Whisky, USA 1997 The Czech Republic is a country in Central Europe with ancient tradition and many historical places of interest. Hence the new series presents the Charles Bridge with its baroque statues in Prague, Upper Square with Saint Trinity column and astronomical clock in Olomouc, and Prague Castle, traditional seat of Czech kings and nowadays the office of the President Vaclav Havel. Bottle height is 7 cm, volume 50 ml each. The whisky producer is Seliko, a. s., Likerka Dolany in Tesetice. All the miniatures are in beige. 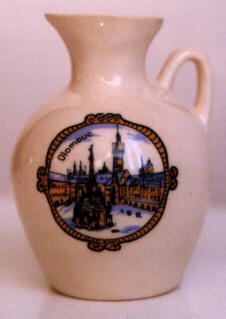 The labels show artistic views of the famous Czech historical places. 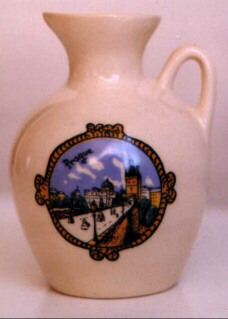 On the backs of the jugs, the second label (invisible in the photographs above) shows the alcohol producer and supplementary information. The labels are produced by a new technology that improves their quality so that the labels cannot be rubbed off. The mini bottles are plugged by corks and, in addition, sealed by coloured wax. This new series is produced in 1999. Recently (since the beginning of the year 2000), the set is available in a decorative cassette. The back of the cassette gives information (in Czech and in English) about the towns shown at the label and a lot of information about the King Barley whisky production in Tesetice.